I’m fortunate enough to be one of the few people who bought the Orange Box without paying for anything twice. 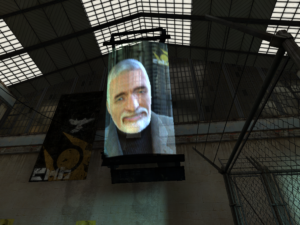 I’d played the original Half-Life, and I knew I wanted to try the sequel, but in 2004, when it was released, my home system was behind the technology curve and probably incapable of displaying the game in all its glory. (Even on my current system, the game doesn’t recommend all the highest graphics settings.) So I resolved to wait for it to be anthologized, and was rewarded for that decision with Portal. The first and most obvious thing about Half-Life 2 is that it’s graphically impressive — far more so than Portal, which used the same engine. I’m probably more easily impressed by graphics than usual right now, given the quality of the 3D graphics in the last game I played, but that’s not all there is to it. Half-Life 2 puts a lot of effort into strutting its stuff. The first room, for example, has a huge holographic TV: a fuzzily translucent texture-mapped object that uses another realtime 3D scene as its texture. It seems to me like this stuff is somewhat front-loaded, with the biggest visual thrills coming at the very beginning, when you’re just walking along and looking at the scenery because you don’t have a gun yet. As with the first Half-Life, this segment of the game lasts a surprisingly long time, but once you can shoot at monsters, the game seems to settle down into mostly tunnels. But it can’t all be tunnels, can it? There are those immense tripod robots; they wouldn’t fit in tunnels. I’ve caught just the merest glimpse of one of those as it lumbered past a barricaded alley, and that glimpse was breathtaking, even though I had seen pictures of it before. So it’s not just the advanced technology that’s impressive: there’s good cinematography showing it off, which is especially impressive when you consider that the player is in control of the camera. But the player, by and large, looks where the designer wants the player to look. As in an adventure game, it’s all about manipulating the player, and rewarding the player for being manipulated. I’m a couple of chapters in now, and the gameplay has been mostly standard FPS fare with scattered puzzles, but with some twists. There’s a kind of flying robot that flashes a bright light at you, blinding you for a few seconds if you were facing it, which gives the player a motivation to aim away from the enemy sometimes. There’s the exploding barrels, which aren’t new in themselves (they’ve been a mainstay since Doom), but the degree to which the enemies use them as a weapon against you is. Anyway, I’m quite delighted with the gleefully grim tone of the work. The original Half-Life, with its ironic juxtaposition of alien carnage with things like workplace safety posters, had a strong vibe of comfortable simplicity running headlong into its inadequacy against the horrors of the world, like a 1950’s film on surviving a nuclear attack. (The title itself seems to have been chosen for this connotation. It has nothing to do with the game’s content.) HL2 turns that up a notch, giving us a smiling, genial politico beaming proudly as he welcomes you to his full-blown dystopia and explains why the planet-wide field suppressing human reproduction is actually a good thing. I just noticed that the options menu, the one with the Save/Load buttons and so forth, had a new option added to it. Actually, that’s not quite right. I noticed an option menu that I didn’t remember, and wondered if it had always been there without my noticing. Silent Hill plays tricks like this in order to create unease in the player, to make you doubt your memory. But any sense of unease here was diminished by the text of the option: “Silly Clown”. This is a reference to QfG2, which had an undocumented Silly Clowns option in its drop-down menu. It wasn’t obvious what it did — you select it, nothing happens. I can personally attest that checking it causes a couple of sarcastic comments to be added to one cutscene. I’ve seen it claimed that it also adds certain jokey mirages to appear in the desert areas — for example, one can glimpse a golf club repeatedly being swung on the other side of a dune, as if stuck in the world’s largest sand trap. It seemed to me that I got these things without Silly Clowns selected, but I could be mistaken. 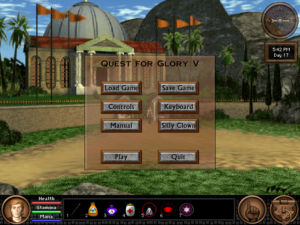 According to a FAQ I just found, the Silly Clowns option in QfG2 was born when “someone mentioned how all the productivity software (spreadsheets and stuff) always seemed to have at least one menu item that did absolutely nothing… So we resolved to have a menu option in QG2 that did nothing.” The QfG2 Silly Clowns option doesn’t quite do nothing, but it really seems to do nothing whatever in QfG5. I’ve looked on Google. Nothing. In fact, as further evidence that it’s just a joke: If you press the Silly Clowns button a second time, it tells you that silly clowns cannot be turned off. Continuing to press it cycles through eight messages, inlcuding the initial one saying that sily clowns are now activated. It reminds me of the “increase lewdness” option in one of the Leisure Suit Larry games — I think LSL3. You could keep increasing the lewdness indefinitely, appending a modifier to the description of the current mode each time to no effect. So this kind of thing is a Sierra tradition. It’s also part of why I describe QfG5 as “goofy”. It should be noted, however, that there are some silly clowns — or former clowns, anyway — in the game, working as cooks at the inn. You never see them, but their antics are described by the proprietor whenever you eat a meal there, as excuses for the food’s oddness. The nice thing about this is that they’re not explicitly described as clowns until very near the end of the game. I was imagining them as merely gnomes, like their employer. We know from previous games that gnomes are fond of puns and practical jokes, which isn’t far removed from slapstick. But clowns makes more sense. My last session was short, and I didn’t really discover anything new. So in this post I’ll critique the user interface. Quest for Glory V is basically a point-and-click game, like most of Sierra’s adventure titles after King’s Quest V. 1In fact, the last Sierra game that had a text parser and 16-color EGA graphics was QfG2, which seems to use a kind of transitional hybrid engine with features of both SCI0 and SCI1 (the engines used by KQ4 and KQ5 respectively). For example, the hero sprite generally has four orientations in Sierra’s EGA games and eight in their VGA games. QfG2 is the only exception, with eight orientations in EGA. 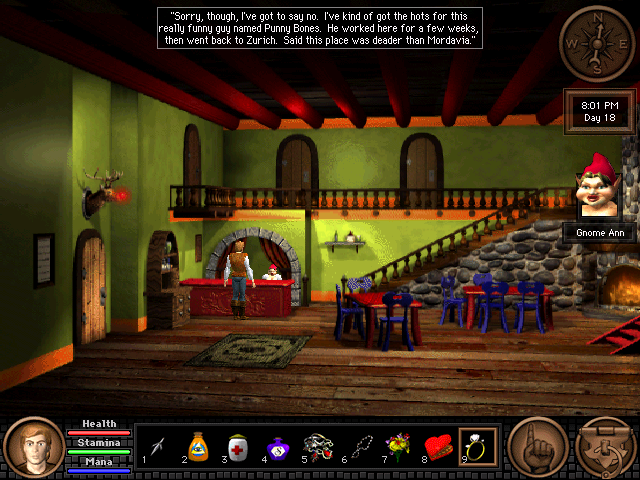 But unlike earlier Sierra point-and-click games, including the previous two QfG games, it doesn’t provide a verb menu. Clicking on stuff generally performs the obvious action: “pick up” if the thing clicked on can be picked up, “talk” if it’s a person, “go” if it’s an exit or bare ground, etc. In some cases, multiple actions on a single object are supported by popping up a menu. In fact, it’s exactly the same sort of menu as is used for conversation. Double-clicking makes you run, a nice feature, especially since you only need to single-click to pick a new destination once you’re running — most locations are wider than the screen, so running all the way to a different exit requires you to click repeatedly as the screen scrolls. (Alternately, you can also move about using the arrow keys, but that’s even more cumbersome, as it forces you to navigate around obstacles manually.) Right-clicking, or left-clicking a button in the UI controls on the bottom of the screen, switches you to “examine” mode, something that’s signalled by a visual change in both that button and the mouse cursor. This is all nicely discoverable without reading docs. There are two parts to using inventory items. 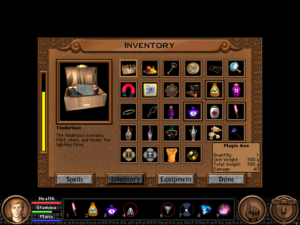 First, you can bring up an icon-based inventory dialog by clicking another button in the main controls. Every icon has a tooltip giving its basic stats, and double-clicking an icon brings up a dialog box with more detailed information and a basic “use” or “equip” button. 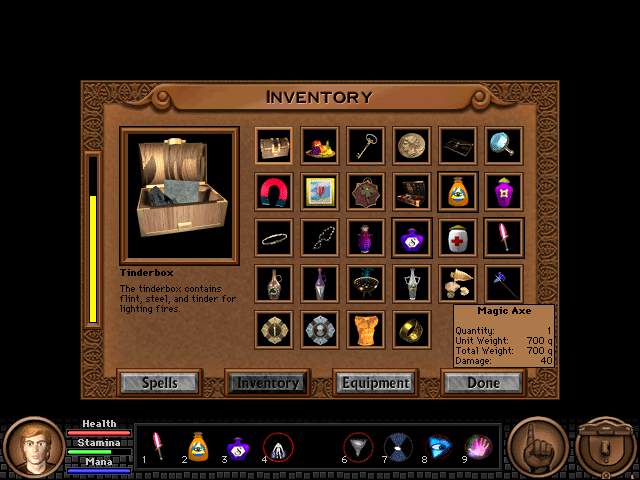 Items can also be equipped from a special interface in a separate tab of the inventory dialog. This provides no new capabilities, but it helps you by gathering the relevant information together: showing you what you have currently equipped, reducing the display to equippable items, and displaying all potentially-affected stats, so you can observe how they’re affected by different items. It bears mentioning that whenever you look at your stats, things that have gone up since you last saw them are displayed in green and things that have gone down are displayed in red, making it easy to tell which stats an item affects even if you’re not paying close attention. I suppose most of this is fairly standard in RPGs by now, but that’s because it’s a really good design. Spells are treated the same as inventory items, but have their own tab. I’m less enamored with the other half of the inventory UI: the way you apply them to the rest of the world. 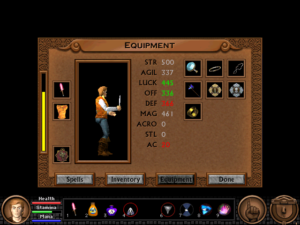 This is done through a quick-select toolbar with nine numbered slots, something that’s been an indispensable part of RPG interfaces since Diablo at least. 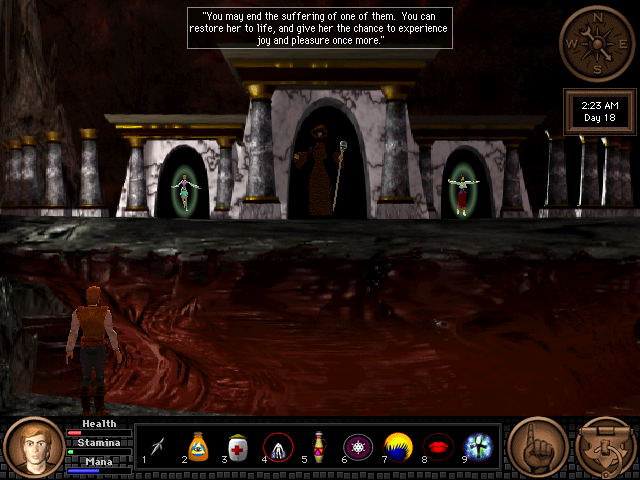 2There are probably earlier examples, but as far as I can tell, Diablo is the game that popularized it. Once you’ve dragged an item or spell from the inventory to the toolbar, you can “Use” it via the keyboard, which is handy for things that you need to use frequently, such as healing pills. 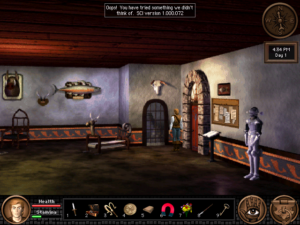 You can also click on an icon to switch to point-and-click-adventure “apply this item to other stuff appearing on the screen” mode, or double-click it for the same detail window as you get from the main inventory. My main beef with this mechanism is that it’s the only way to apply inventory items to the environment. You can’t switch to “apply item” mode directly from the inventory dialog; you have to drag the item onto the toolbar first and then use it from there. That may be OK for RPGs, where you tend to use the same things repeatedly, but for adventures, where exceptions are the norm, the “quick select” actually slows you down. I have a backpack full of items that are only useful in one or two situations, so they’re never already on the toolbar when I need them. Also, there’s a little conceptual inconsistency that confused me at first. Remember, any item can go into the toolbar, even a weapon. In fact, when you start the game, your starting weapon is already in slot 1. Pressing the key corresponding to a weapon toggles it, equipping it if it’s unequipped and vice versa. This is effectively a mode change: equipping a weapon doesn’t have a direct effect, but changes the action you perform when clicking on an enemy. Offensive spells are conceptually similar to weapons, so the player 3By which I mean me. But I’m not alone on this: other people have reported similar confusion in the forums I visited while looking for help with bugs. is likely to try to use them the same way at first, and it doesn’t work. You have to click on the spell icon to cast it at something; just pressing the number is always interpreted as casting it without a target, which only works for spells that affect the player character (like Levitate) or the general area (like Calm). I’m not sure what the best solution to this is. Obviously you could make things consistent by taking away the weapon-toggling, but being able to switch between combat and non-combat modes quickly seems important, so I suppose I’d resolve it by introducing more inconsistency, which hardly seems like a solution at all. Playing a spellcaster adds a mana gauge to the display and the “spells” tab to the inventory, and in both cases they’re added in places that didn’t even look empty when I was playing as a Fighter. The Thief has additional capabilities too, but the game doesn’t add anything to the GUI for them. 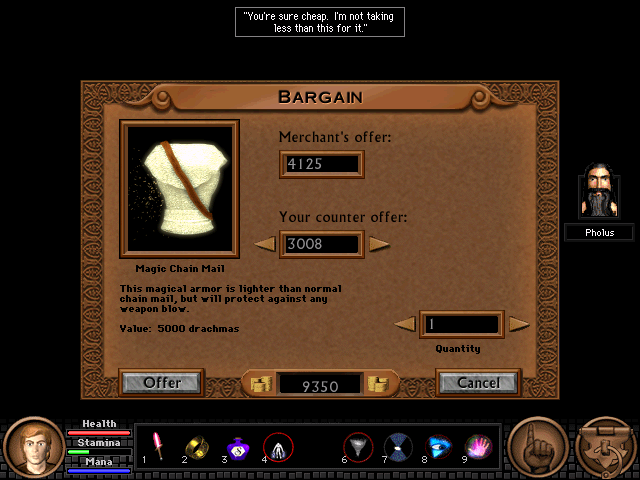 This is a break from the previous games: QfG3 and QfG4 put Thief skills into a special section of the action menu, similar to how they handled spells. 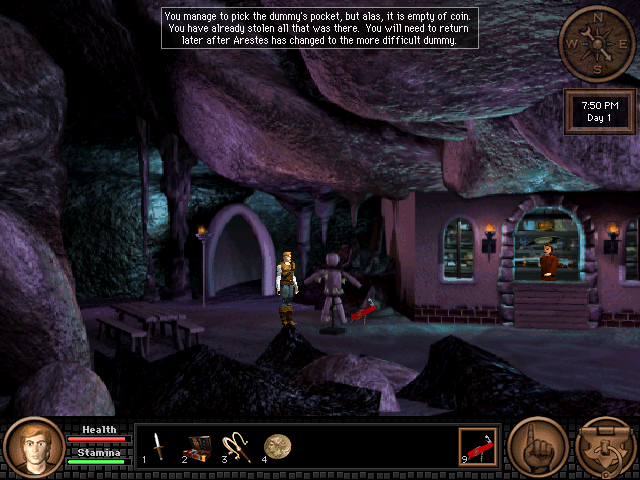 In QfG5, they’re handled either through Thief-only inventory items or additional menu options: click on a locked door, and you get “Pick lock” appended to the normal list of “Listen”, “Knock”, and “Force open”. This is mostly handled well, although I have to wonder why a guy who was scaling walls with his bare hands four games ago is now completely dependent on his rope and grapple. But there’s one Thief skill that can’t be used from the GUI at all, and it’s a very important skill: Sneak. Sneaking is a mode, not an action, and there’s no GUI button for it, so the only way to toggle it is through the keyboard. I’ve noted before how certain actions in combat can’t be performed without the keyboard, and it still it seems like a bad move to me, even putting aside the flakiness of keyboard events in this game. This is a game that’s clearly dependent on the mouse (as there’s no other way to target environmental objects), and the mouse alone is sufficient for 99% of the things you do in the game. 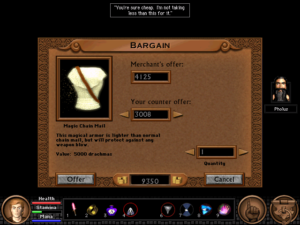 Even the haggling interface allows you to alter your offer price by clicking on +1/-1 buttons. (It would be impractical to use this for prices in the thousands, but the option is there all the same.) But there’s that 1% of cases that can’t be handled through the game’s dominant input device, and it rankles. 1. ↑ In fact, the last Sierra game that had a text parser and 16-color EGA graphics was QfG2, which seems to use a kind of transitional hybrid engine with features of both SCI0 and SCI1 (the engines used by KQ4 and KQ5 respectively). For example, the hero sprite generally has four orientations in Sierra’s EGA games and eight in their VGA games. QfG2 is the only exception, with eight orientations in EGA. 2. 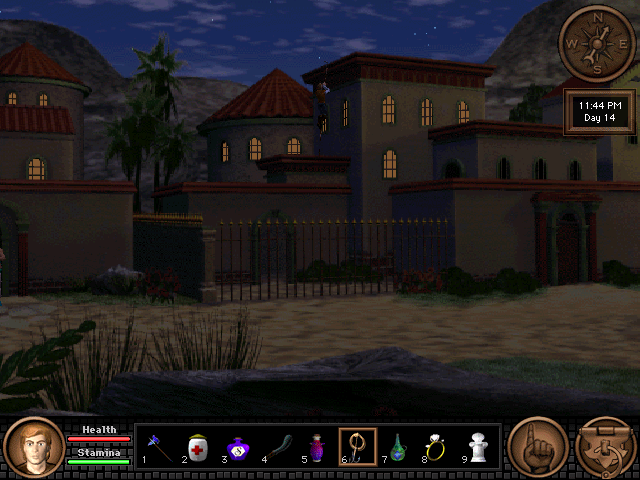 ↑ There are probably earlier examples, but as far as I can tell, Diablo is the game that popularized it. 3. ↑ By which I mean me. But I’m not alone on this: other people have reported similar confusion in the forums I visited while looking for help with bugs. There are always complications, aren’t there? The Rite of Freedom: The fishing villages along the coast are occupied by Hesperian mercenaries. Each of the five candidates for the throne is supposed to liberate a different village, and return with its sigil as proof. (I suppose the fact that there are five villages is the reason that the Rites require five participants.) The significance of the sigil is unclear to me, but the mercenaries must think it’s important, because they abandon the village when you find it. The Rite of Conquest: Assault the mercenaries’ island fortress and bring back their general’s shield. There doesn’t seem to be a nonviolent way to do this, even though you’re explicitly told that negotiating a truce would be considered just as much a success as flipping out and killing everyone. The Rite of Valor: On a remote island lives the Hydra. It never truly dies, but chopping off its heads and applying fire to the stumps will render it dormant for years, and it’s kind of traditional for heroes to do this. This Rite apparently requires two people, one to administer the chopping and one to handle the fire, but only one person can bring back its teeth as proof of victory. Although it seems like the Paladin’s flaming sword should be able to do both jobs, no? The Rite of Destiny: The first Rite that doesn’t involve fighting! All you have to do is go to Delos Island and listen to the sybil there tell your future. In the case of the player character, this consists mainly of dire warnings about the need for self-sacrifice to avert disaster. The Rite of Courage, which you might think is a synonym for Valor, but no, it’s a different rite: Descend into the underworld and bring back water from the river Styx. And while you’re down there, you might as well pick out a wife. 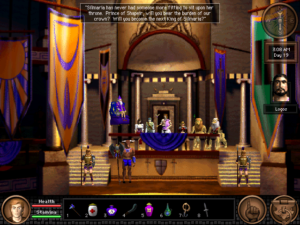 The Rite of Peace: In something of a throwback to the first two rites, you have to stop attackers from making war on the kingdom’s ships. This time, though, it’s the tritons inhabiting the sunken ruins of Atlantis, which gives the designers an opportunity to show off underwater combat. The Rite of Justice: Find out who the ultimate bad guy is and win the game. This is the one rite I still haven’t finished. You might object that some of these rites don’t seem to be helping the kingdom at all. How is there a pressing need to kill a hydra on a distant island? Or to visit an oracle? If you make such objections, you’ll be pleased to learn that you’re not alone: Elsa von Spielburg voices similar sentiments. Rakeesh, a liontaur paladin and old friend of the hero who’s helping out in organizing the Rites, will explain if you ask him: during each of the first two Rites, one of the participants was murdered. So for the third and fourth, they just wanted excuses to get you as far out of harm’s way as possible. Now, to some extent, the rites support multiple approaches. You can win the Rite of Peace by singlehandedly taking on the Altantis home guard and forcing the queen to surrender, or you can sneak into her throne room and use diplomacy, convincing her of your honest intentions and then proving that she’s been tricked into war by the story’s true villain. (Fighters get extra points for choosing the violent route, and I think it likely that Thieves are rewarded for the sneaky one.) Similarly, I was able to complete the first rite, the Rite of Freedom, without fighting at all in my Wizard game simply by casting Calm repeatedly until I had the sigil. As a Thief, I can do almost as well at avoiding combat in the Rite of Freedom. If I wait until nightfall, I can sneak to the building containing the sigil without being spotted. However, there are four guards inside, and no obvious way to avoid them. Even as a Thief, I can take them in a fight if I pop a healing pill every four seconds. But I feel like there must be a more thiefly way — something where I create a distraction, make them evacuate the building or something. So I’ve been devoting more thought this rite as a Thief than I did with the Fighter or Wizard. How does a Thief approach this kind of competition? When you think about it that way, the answer is obvious: He cheats. OK, so how do you cheat? The only way I could think of was to interfere with the other candidates. If I could steal their sigils from them before they brought it back, they wouldn’t get credit for winning. Better yet, perhaps I could sneak in there and get the sigils from the other villages before them. Somewhat to my surprise, this worked. Not only is it possible to get the sigils from all five villages for yourself, you also get ten points and a unique magic item with each one. And this reward isn’t limited to the Thief, which makes sense when you think about it. All five villages need to be saved, and you’re a hero, so save them is what you should do, regardless of whether you’ve been assigned to the task or not. I’ve been saying all along that starting over with a different class is a good way to find things that you missed the first time round, but I wasn’t expecting to find missing points before I completed the game and knew how many points I was missing. At any rate, I still think I may be missing out on something with the Thief. But now I have a motivation to replay most of the game with the Fighter and Wizard as well, to get the 40 points. At this point, I’m glad I advanced them as much as I could before starting the Rites. I may well stop devoting my time to one class at a time now, and play the game more like I played QfG1: bouncing back and forth between saved games for every class, playing whatever part of the game I have ideas about. I’ve been doing as much as I can with the Thief before starting the Rites. I expect the Rites will go fairly quickly once I start them, since I already know the puzzles for most of the game, will have most of my stats maximized already, and won’t have lengthy combat scenes slowing me down. It turns out that the Thief does get a certain number of points for wrongdoing. I basically just hadn’t been aiming high enough. Why should a master thief be rewarded for pinching a vase from an empty house when there’s a bank vault to rob? I think I’ve gotten all the Thief-only points you can get pre-Rite, but it took some doing. Much of my gaming time since my last post was spent battling a bug that prevented the game from acknowledging one of my deeds. There are a lot of bugs in this game — more than I’d expect after applying patches by both its creators and its fans. I’ve mentioned a few: the problems with sound and video, the poor keyboard response that makes some combat options unusable. The game uses a set of custom mouse pointers (the appearance varying with context), but on my system the OS default mouse pointer overrides it. Quite by chance, I discovered that you can fix this by switching to another app with alt-tab and then switching back, so now that’s the first thing I do at the beginning of every session. Then there’s the probably-inadvertent imbalance of breath weapons, which are nearly instant death. This cuts both ways: the Wizard has a spell, “Frost Bite”, that acts like a breath weapon, making him basically invincible as long as his supply of mana potions holds out, but the Fighter has great difficulty getting his Fighter points for slaying dragonlike monsters. 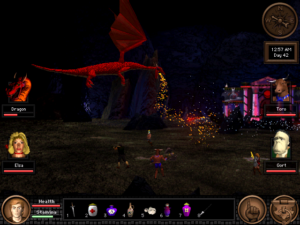 The Dragonlings, miniature dragons that swarm like bats, are particularly fearsome in this regard, because their breath has the strongest offensive capability imaginable: the ability to crash the game. Those bugs are probably all consequences of playing the game on a sytem with specs years in advance of anything that the programmers could have tested on. Even the breath-weapon imbalance could well be a matter of not correcting for CPU speed correctly. 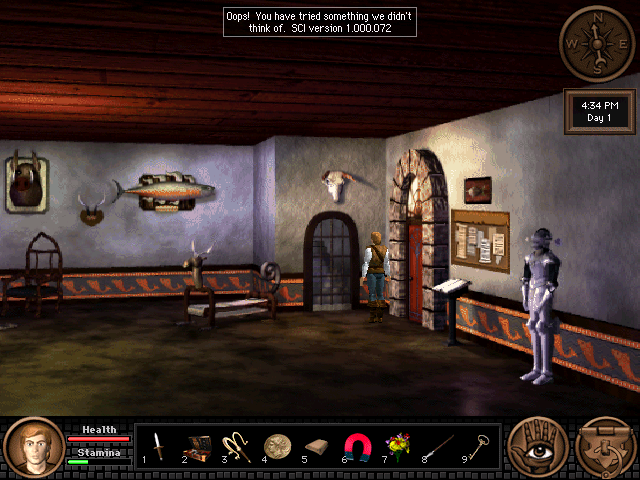 There’s another class of bugs, game logic bugs that must have been present from day one, such as when you examine a mounted skull in the Adventurers’ Guild and get the response “Oops! You tried something we didn’t think of. SCI version 1.000.072”. For the most part, these are minor things, and easily detectable when they happen. The really insidious thing about the pickpocket-dummy bug is that it’s something that you wouldn’t necessarily notice when it happens. It’s only by luck that I managed to “successfully pickpocket the dummy” the first time. I could have easily played the rest of the game, and wound up wih 995 points and no clue about where to find the rest. Even worse is knowing that most players probably wouldn’t care. In trying to find help for the bug online, not only did I not find any suggestions, I found that the people asking for help with it were outnumbered by the people who said things like “Don’t bother learning Pickpocketing, it’s not worth it.” Which makes me doubt my points-as-motivation thesis somewhat. It seems they’re only a motivation for some people. Not a lot to report here. In my last session, I made no progress whatever. I’m supposed to be stopping the bad guy, but he isn’t making a move that I can stop. Elsa believes that her sponsor, Minos, is the mastermind behind everything, which wouldn’t be at all surprising, as he’s got villain speech patterns and a villain wardrobe. But his island is surrounded by a mysterious barrier that I can’t breach. It’s the only remaining unvisitable spot on the overland map, so obviously I need to get there somehow. There’s one other obvious way to go at this point: the last remaining dragon pillar. The dragon pillars bear the enchantment used to bind the anticipated dragon underground; there used to be seven, but one has been destroyed during each Rite. The last pillar is in a cave, near an underground temple that I can’t reach because it’s surrounded by lava. I have a potion that will allow me to survive the lava’s heat, but no way to actually cross it. You might think I’d be able to levitate to the cave ceiling and push my way across against it, but that hasn’t worked. I’ve started a new game as a Thief, but haven’t played enough to get to any Thief-specific content. Expect a report on that in the next post. 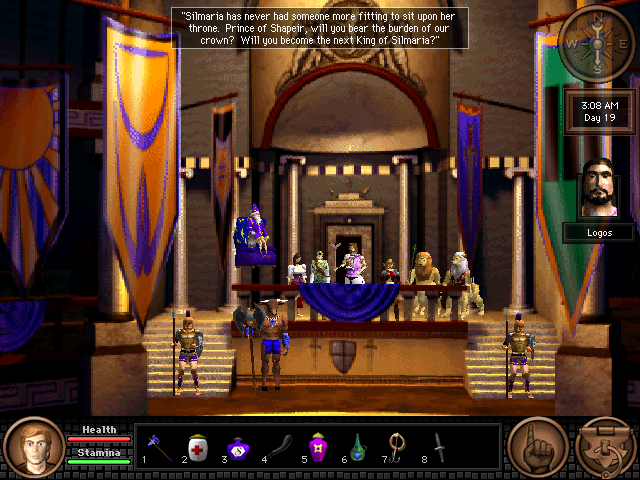 I keep thinking of the courtship material in Quest for Glory V as a mini-Dating Sim, but any resemblance to actual dating sim games is almost certainly coincidental. The genre was pretty much unknown outside Japan in 1998 — heck, it’s almost unknown outside Japan today. The closest thing to a mainstream American version of the genre would probably be Leisure Suit Larry 1Notably, a Sierra game, like the QfG series and its progeny: “adult” adventure games where the primary goal is seduction. But there are major differences, and to my mind, the biggest difference is this: In the American version, the player encounters a series of women, and must (or at least can) have “successful encounters” with them all. In the Japanese version, there are also a number of available women, but the whole idea is to choose one, and, provided you’ve made the right decisions in your interactions with her throughout the game, to have her choose you as well. You might pursue multiple possible lovers over the course of the game, but in the end, you have to pair off with one and one only. So it’s interesting to me that the authors of QfG5 invented a simplified form of the Japanese model without any likely direct influence. There are several available female NPCs. There is a wedding ring, the “Ring of Hera”, a unique item 2Apparently there was a bug in the initial release that allowed the player to purchase multiple wedding rings. Since I patched before playing, I don’t know how badly this messes things up. that you can present to whoever you like as a proposal of marriage. Towards the end of the game, it’s possible that someone will even accept, depending on how you’ve treated her, and since this is definitely the final chapter of the story, the two of you presumably live happily ever after. There seem to be three components to the proposee’s decision. First, you have to talk to her about a bunch of different things, or she’ll object that she hardly knows you. Every NPC’s conversation menu changes as the story goes on, so this is basically a limit on how early in the game you can propose. Secondly, you have to give her stuff. Not specific items, just a sufficient total value of acceptable items (you can tell when you’ve given enough from her reaction). This probably sounds degrading, as if you’re buying her affections, but the in-game dialogue makes it clear that the authors thought of it as confirming that you know the woman well enough to know what sort of thing she’d like. Everyone seems to appreciate flowers, but Nawar (a bellydancer at the bar) is fond of jewelry, while Elsa von Spielburg rejects such frippery in favor of combat-enhancing magic items. Thirdly, there seems to be some consideration of indirect behavior. The first time I tried proposing to Elsa, she told me that I had given her no reason to believe that I respect her fighting skills, which I take to mean that she wants a man who would go to cheer her on in the arena when she fought there, and possibly bet on her. I have managed to convince four women in the game to accept my proposals of marriage. (Not all in the same game, obviously.) I’ve mentioned two: Elsa and Nawar. The other two are the dead chicks. See, in the fifth Rite, you go to hell. There are two spirits there who you know from previous games, one Good Girl and one Bad Girl. 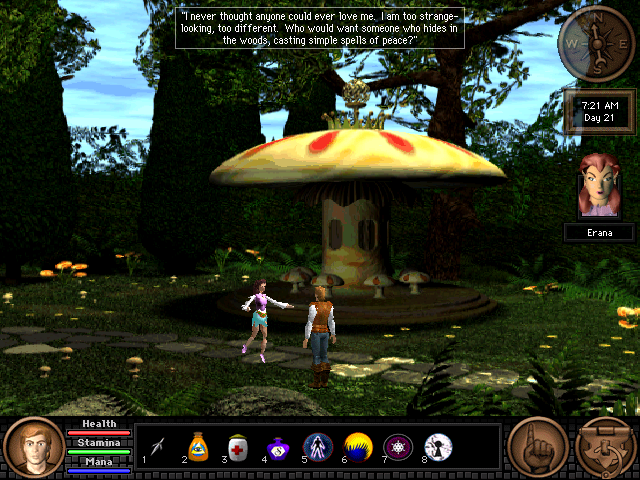 The Good Girl is Erana, the half-faerie archmage who spent her life wandering the globe and planting enchanted gardens so that heroes would have a place to sleep outdoors without being et by wandering monsters, and who ultimately sacrificed her life to prevent QfG4‘s “Dark One” from awakening. 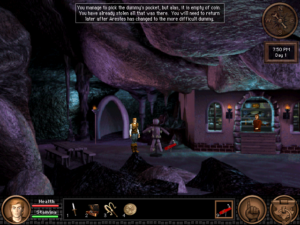 The Bad Girl is Katrina, who began QfG4 as an apparent damsel in distress, became more like a woman of mystery, and finally turned out to be an obsessed vampire sorceress bent on awakening the Dark One from His eternal slumber. By the end, she was starting to find redemption through her love for the hero, but she got killed anyway, and it was all quite tragic. You can free one of these two from death, and there aren’t even any stupid rules about it like with Eurydice. But whichever you choose, the other is consigned to oblivion, which just doesn’t seem fair. If you’re really heartless, you can just leave them both there, but you cheat yourself out of some content that way. 3There’s actually some motivation to do this: as the price of raising the dead, your Stamina goes down 50%. But this isn’t as bad as it sounds. Stamina is probably the easiest stat to raise, thanks to the exercise equipment in the Adventurers’ Guild. Anyway, either one will marry you with minimal prompting. 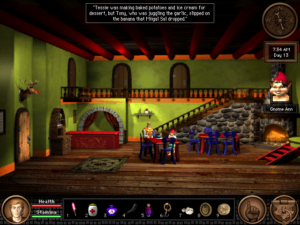 There are a couple of other NPC women who may or may not be marriagable: the flirtatious but punning gnome who runs the inn, the overweight bartender who talks like Mae West. But then again, the authors might have intended the four potential wives that I know about to correspond to the four character classes: materialistic Nawar is the obvious match for the Thief, bellicose Elsa is the Fighter’s mate, Erana has been called “a paladin in all but name” within the game, and that leaves the goth in the tower for the Wizard. This is exactly the kind of fourfold symmetry that was originally supposed to be in the architecture of the series as a whole. Just one thing: not all wives are equal. As with any difficult task, proposing marriage earns you points. And yes, even talking about this seems demeaning to the characters again. The game is giving me a choice of my alter-ego’s life-partner. Do I really want to base that decision on who has the highest point value? Yes. Yes, I do. I’m sorry. I want my full 1000 points no matter what it takes, and that puts limits on who I can marry. I do still get some choice: both of the dead chicks are worth 20 points. Elsa comes in third at 15 points, and Nawar — who, let’s face it, has no great appeal beyond the theoretical hotness of her profession — clocks in at 10. But I’ll still probably want to check out how it ends with every possible wife. And, for that matter, with no wife at all. This whole aspect of the game seems to be optional. Romantic elements in games are peculiar. I’ve spent so much of this post describing the courtship in this game in reductionistic terms because that’s the approach that the level of simulation invites: we know full well that this is a machine following simple rules and spitting out canned text. But for all that, I have to admit that I felt a little thrill when Erana said yes (the first yes I received), and that it wasn’t just the thrill of solving a difficult puzzle. The poignancy of Erana’s position helped: even as one of the most accomplished mages in the world, and one of the most compassionate, she felt herself such an outsider that the idea of being loved humbled and amazed her. All this emotional revelation was provoked by the game engine processing a couple of flowers and a box of chocolates. But even with such a crude emotional model, the game provides us with the emotive power of fiction, amplified by player involvement. This can work very effectively for fear as well. 2. ↑ Apparently there was a bug in the initial release that allowed the player to purchase multiple wedding rings. Since I patched before playing, I don’t know how badly this messes things up. 3. ↑ There’s actually some motivation to do this: as the price of raising the dead, your Stamina goes down 50%. But this isn’t as bad as it sounds. Stamina is probably the easiest stat to raise, thanks to the exercise equipment in the Adventurers’ Guild. I have been really dragging my heels on this game — it’s not that big, but I’ve been taking about a week between sessions. I’m not sure why. It’s enjoyable when I’m playing it, but somehow I find myself more willing to waste my leisure hours on other pursuits lately. Maybe this whole computer game thing was just a phase for me and I’m finally outgrowing it. Ha ha. Seriously now, let’s talk about the game. I made a lot of progress last night: by the time I stopped, I had 920 out of 1000 possible points and had completed six out of the seven Rites. The seventh one is to actually identify and stop the villain who’s trying to free the Dragon of Doom, bane of Atlantis. I assume that I’ll have to confront the dragon itself, and that this will be the ultimate encounter for the entire series. Which is kind of weird. QfG3 had you battling demons, and QfG4 put you up against a Lovecraftian Great Old One. Going from that to a dragon seems like a step or two down. It really all comes down to QfG1. There manual for that game talked about dragons, even though there were none in the game. Dragons were the thing you’re not tough enough to beat yet, which is quite reasonable for the first episode, when you’re just starting to learn heroing. QfG1 generally kept things small — instead of battling to save the world from destruction, as is the fantasy-game cliché, you battled to rescue a baronry (not even a kingdom!) from a curse. The biggest menace was a band of brigands. At the time, I thought that starting small and leaving the story with room to grow in scale was a good move. I more or less changed my mind about that when I played Final Fantasy VII, which starts big and manages to keep escalating in scale anyway, but good or bad, QfG1‘s scale was sub-dragon. However, its outro pretty heavily implied that there would be a dragon in QfG2, which was suggestively subtitled Trial by Fire. There wasn’t. For all I know, there may have been a dragon in some draft spec, but the game we got used elementals and djinni as its big monsters. So perhaps the authors had painted themselves into a corner here: having made a big deal about dragons, they had to produce a payoff, and the longer they put it off, the more epic it had to be. The disappointing part of this is that it means I probably won’t get a chance to actually fight it. I saw the skeleton of a dragon during the pseudo-Grecian-hero’s mandatory jaunt through Hades, and it was large enough to seem architectural rather than biological. I can’t imagine something like that working in this game’s combat engine. (In Final Fantasy VII, sure, but not here.) But I suppose that if you really want to go toe-to-toe with a dragon, you get your chance with the Hydra back in Rite 3. Anyway, assuming I figure out how to even get started on the seventh Rite, one more session should be enough to reach the end of the story as a Wizard. But I’ll still have a way to go before I’m really finished with the game. Not only are there the other character classes, there’s a bit of plot branching that seems worth exploring, particularly where it concerns the game’s courtship mechanism. I’ll talk about that in detail in the next post.